Nature's Science COCONUT OIL ™ is made with natural certified organic coconut oil! Nature's Science COCONUT OIL provides 4,000 mg of pure certified organic coconut oil and is an easy and convenient way to add medium-chain triglycerides to your diet. Coconut oil has traditionally been used in the Pacific Islands and is now being recognized worldwide for its health benefits. The unrefined oil is one of nature’s richest sources of health-promoting medium-chain triglycerides, which are rapidly absorbed in the body to provide a quick energy source. 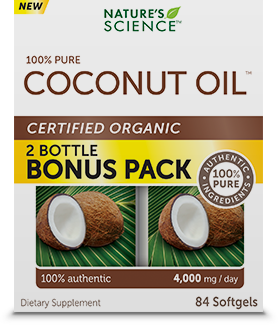 Nature's Science COCONUT OIL provides 4,000 mg of pure certified organic coconut oil and is an easy and convenient way to add medium-chain triglycerides to your diet.